It's 21:02 in Beaver Cove, USA right now. 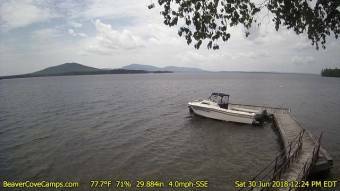 Moosehead Lake A webcam in Beaver Cove, Maine with weather data and timelapse video. The Forks, Maine: Snowmobiling - Northern Outdoors Adventure Resort, 24.9 miles away. Medway, Maine: I-95 Southbound near Milepoint 241, 49.9 miles away. Newport, Maine: I-95 NB Northbound Milepoint 159.1, 51.6 miles away. Lincoln, Maine: I-95 Northbound near Milepoint 229, 52.8 miles away. Carmel, Maine: I-95 Southbound Near Milepoint 177.2, 57.9 miles away. Sherman, Maine: I-95 Northbound Near Milepoint 265, 59.2 miles away. Orono, Maine: I-95 Southbound near Milepoint 191, 63.4 miles away. Bangor, Maine: I-95 Southbound Near Kenduskeag Avenue Bridge, 64.5 miles away.